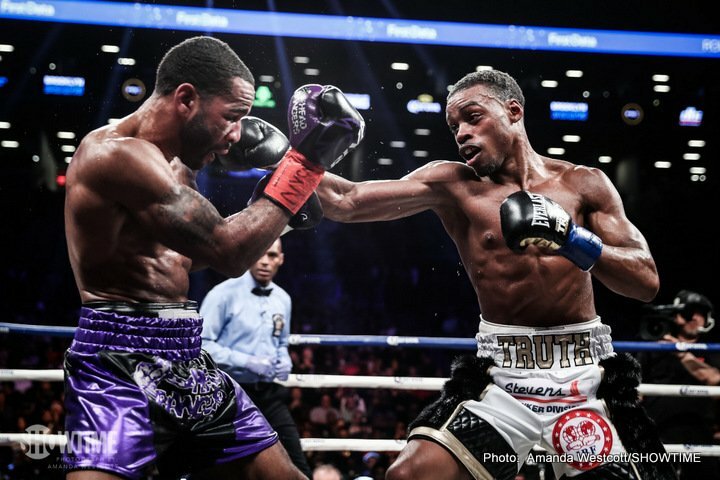 IBF World welterweight champion Errol ‘The Truth’ Spence Jr. (23-0, 20 KOs) wore down and halted former 2 division world champion Lamont ‘Havoc’ Peterson (35-4-1, 17 KOs) in a 8th stoppage on Saturday night at the Barclays Center in Brooklyn, New York. The fight was halted by Peterson’s trainer Barry Hunter at the start of round 8. Peterson was too beaten up for Hunter to allow the fight to continue. Spence knocked Peterson down in round 5 after nailing Peterson with 3 consecutive hard head shots. Peterson never really got un-tracked tonight. Each time Peterson would land anything of note, Spence would return fire and nail Peterson at will. Spence impressed with the way he took apart a very good fighter in 33-year-old Peterson. When you compare the performance Spence put in tonight with how Danny Garcia had to labor to beat Peterson in 2015, it’s like night and day. Spence showed how much better he is than Garcia with the way he bludgeoned Peterson for 7th rounds. Spence took his foot off the accelerator after round 5, and coasted in the 6th and 7th without really taking the fight to the softened up Peterson. Peterson landed some nice shots in rounds 3, 4 and 5, but the problem is they so few in number. Spence was out-landing Peterson by a wide margin, and it was clear that the fight wasn’t going to be able to go that long with the way things were going. Peterson wasn’t able or willing to throw more punches. It looked like Peterson was afraid of the incoming punches from Spence, so he wouldn’t bother taking risks. Spence’s 5th round knockdown of Peterson was really the end of the fight for all intents and purposes. After that, Peterson was fighting on fumes in round 6 and 7, and Spence looked like he didn’t have the heart to put the former 2 division world champion out of his misery. Rounds 6 and 7 were anticlimactic. Spence landed shots, but his work rate went down dramatically, and it looked like his heart was no longer into what he was doing. Peterson’s trainer probably should have thought about stopping the massacre after round, considering that the fight was pretty much over at that point. Going into tonight’s affair, Peterson, 33, was supposed to be the 2nd toughest fight of Spence’s career after Kell Brook, but it didn’t look that way. Spence arguably had a tougher time against Leonard Bundu in 2016. It’s hard to know how much Peterson was impacted by his 11 months out of the ring leading up to tonight’s fight. Peterson hadn’t fought since February of 2017 in beating David Avanesyan. Peterson was asking for trouble in facing Spence after nearly a year out of the ring. Some fighters can stay out of the ring for 11 months and still fight at a high level, but Peterson did not look like the time off had helped him.